This is another one for the "bachelorette cooking" files, I guess. Above is a versatile cold noodle/peanut butter sauce dish that I don't have a real recipe for, since it's something I usually throw together with whatever I've got in the pantry. With the noodles I alternate between wheat or buckwheat: soba or the thick, chewy noodles that Koreans use in jajang myeon or champong. I make the sauce with thinned-out peanut butter, chili garlic paste, sesame oil, soy sauce, and rice vinegar. I add chopped scallions if I have them. Any of these last five can be added in varying proportions or omitted. Beyond that, lately I've been mixing in grated cucumber, which is why this particular version looks so wet. I've added grated carrot too, which lends a nice sweetness—going heavy on the veg makes this not-so-healthy dish a little lighter. I've also added shredded chicken breast when I want protein; firm tofu would work nicely if you want to keep it vegetarian. 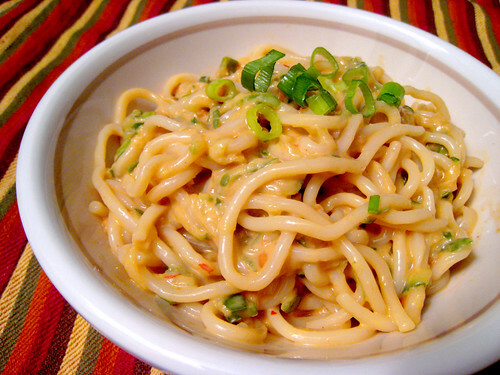 In short, peanut butter and noodles can be all you want them to be. Sort of like a soldier in the army. But not really. My mom makes something similar and it's a family favorite that shows up at every BBQ. I was thinking of your mom as I wrote this, actually! I always had a good helping whenever she served them. Mmm.